Appearing before the CECCYT of the National Assembly led to agreements regarding Yachay Tech’s budget. 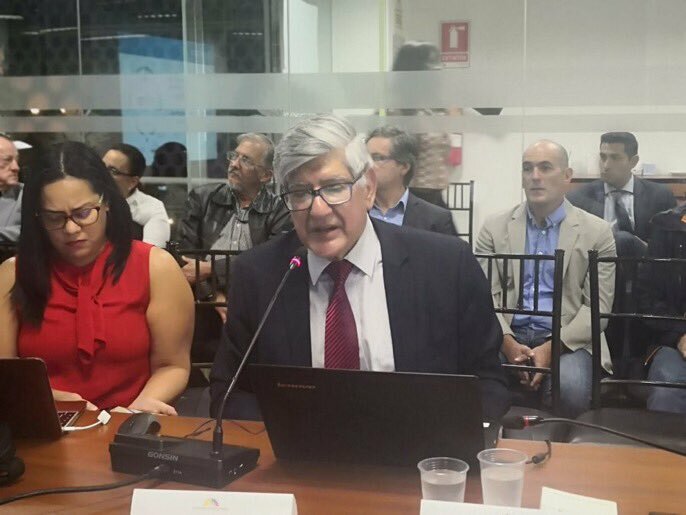 Eduardo Ludeña, Ph.D., rector of Yachay Tech University appeared before the Commission of Education, Culture, Science, and Technology (CECCYT in Spanish) of the National Assembly, to address the budgetary situation of the University. The appearance was requested by the legislative committee after a group of assembly members visited the University campus in late January, 2019. University authorities and Adrián Bonilla, Secretary of Senescyt attended the appearance held at the facilities of the National Assembly on Monday, February 4, 2019. This year, Yachay Tech University is facing a 20% budget cut compared to last year’s budget. This budget cut will restrain the University’s proper operation for the rest of the year, so authorities requested the support of the assembly members to seek budgetary compensation. In this sense, Silvia Salgado, Diego García, and José Chalá, assembly members for Imbabura, expressed the importance of Senescyt’s support in requesting the Ministry of Finance the budget that the University needs to operate. García highlighted the importance of safeguarding the rights of Yachay Tech students and faculty, who will be the most affected with the budget cut. Finally, Yachay Tech authorities, Senescyt and the assembly members of the CECCYT agreed to schedule an extended meeting with the Board of Trustees to submit a request to the Ministry of Finance. The meeting will be attended by the members of the Board of Trustees and members of Senescyt and Yachay EP. The meeting will be held on Thursday, February 7, 2019, and will result in a specific request to the Ministry of Finance for the restitution of the budget cut. Additionally, at the meeting, the Board of Trustees will work on a request for funds so that, through Yachay EP, the Senescyt building that will provide space for classrooms and laboratories to the University can be finished.